Nope, these burgers have nothing to do with everything bagels. They are simply topped with, well, everything. 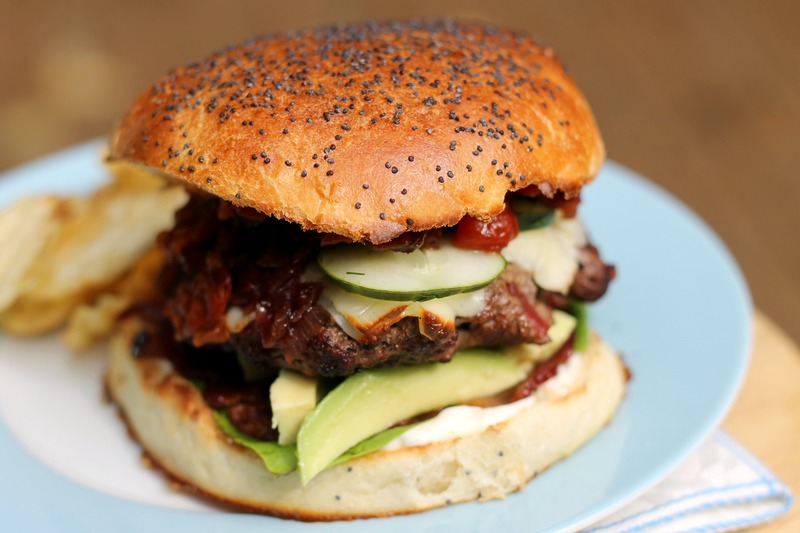 Let’s make a list: you start with a homemade bun and then you top the bun with quick garlic aioli, lettuce, sliced avocado, a burger patty, cheese (any kind you like), homemade pickles that take about five minutes of work, caramelized onions, and tomato jam. They are a mouthful (literally and figuratively!). I mean, the only toppings these burgers are missing are bacon and a fried egg, which would borderline on ridiculous, so we’ll stick with these the way they are! The tomato jam has chorizo in it, so of course it has to be good. The aioli has lemon juice, zest, and garlic and provides a nice tangy but creamy base for the burger, the caramelized onions are made with red onions and cook for about 45 minutes until they are almost jam, and the dill pickles are so simple that you will never go back to store-bought! This recipe comes from the Tartine Bread Cookbook, which our aunt gave to us. Their recipe calls for homemade brioche buns, which require a good bit of planning ahead. We just made Annie’s Eats burger buns, which are fabulous too! Still, we have to give Tartine’s recipe a try sometime. So…if you are looking for what may be the best burger out there (well, best non-vegetarian burger, because these are pretty far from vegetarian! ), then you may have found your answer here. You can make the toppings and buns in advance, and then just grill and assemble at the last minute to make them manageable. You won’t be disappointed! Melt the butter in a pan over medium heat. Add the onions and salt and cook, stirring every minute or two, until they are soft and translucent, 10-15 minutes. Continue cooking without stirring until the bottom of the pan starts to turn brown, about 5 minutes. Stir the onions well and scrape up the brown bits from the bottom of the pan. Continue this process for 10-15 more minutes. Add the vinegar and stir. Cook for one more minute. Transfer the caramelized onions to a bowl and set aside to cool. Put the chorizo in the skillet you used to cook the onions over high heat. Cook the chorizo until it releases fat, about 5 minutes. Add the shallots and cook until it softens, about 3 to 5 minutes. Add the cherry tomatoes (whole) and cook until the tomatoes burst and let out liquid, stirring occasionally. Reduce the heat to medium and add the marjoram, thyme, and currants. Cook, stirring very frequently, until the jam is thick and the liquid is mostly evaporated. This will take about 15 minutes. Stir in the vinegar, brown sugar, and salt a few minutes before it is done. Set it aside in a bowl. Stir together the mayonnaise, olive oil, garlic, lemon zest, and lemon juice. Store in the refrigerator until serving. In a bowl, stir together the vinegar, water, salt, and dill. Add the cucumbers and make sure they are covered with liquid. Set aside until it is time to serve them. Note: you don’t want to make these too far in advance because their pickling liquid is very strong. They don’t need to sit in there long because they absorb the flavor quickly. Preheat your grill on medium-high heat. Divide the meat by 6, and shape into patties that are about 1/2-1 inch larger than your buns, as they shrink a bit. Make a small indentation in the center (this helps prevent them from becoming meatball-shaped). Salt and pepper the patties. Place on the grill and cook for about 3-4 minutes on each side, or until they are done to your liking. A couple of minutes before they are done, top with cheese. Allow the cheese to melt, then transfer to a plate and let rest for a minute or two. Cut the buns in half and toast them, either under the broiler or on the grill. Top your burgers as desired and serve. Enjoy!